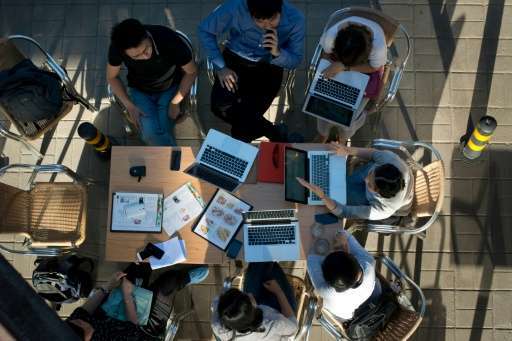 China plans to launch its own online encyclopaedia next year, hoping to build a "cultural Great Wall" that can rival Wikipedia as a go-to information source for Chinese Internet users who Beijing fears are being corrupted by foreign influences. China is under pressure to write its own encyclopaedia so it can guide public thought, according to a statement by the project's executive editor Yang Muzhi published last month on the website of the Chinese Academy of Sciences. He once listed Wikipedia, which is available in China, and Britain's Encyclopaedia Britannica as potential rivals and said the project aims to exceed them, according to an article he wrote late last year. The project, which will be under the guidance of the state-owned China Publishing Group, "must have Chinese characteristics," he wrote, adding it would be a "symbol of the country's cultural and technological development" and increase its softpower and international influence. Unlike Wikipedia—and its Chinese version Baidu Baike—which are written by volunteers and are in a constant state of revision, the new project, which was approved in 2011, will be entirely written by professionals. So far over 20,000 scholars and academics have been enlisted to compile the project, which aims to have more than 300,000 entries by its 2018 launch. The new encyclopaedia will be based on a previous printed version, published in book form in 1993. A second edition, which can be accessed through a special terminal, was released in 2009. The newest version will be released online before being published in a bound edition. China has over 700 million internet users but a 2015 report by US think tank Freedom House found that the country had the most restrictive online use policies of 65 nations it studied, ranking below Iran and Syria. It has maintained that its various forms of web censorship—collectively known as "The Great Firewall"—are necessary for protecting its national security. Sites blocked due to their content or sensitivity, among them Facebook and Twitter, cannot be accessed in China without special software that allows users to bypass the strict controls. Beijing issued a new restriction for online freedoms, requiring Chinese Internet users to provide their real names when accessing online news sources. The new restriction will come into effect on June 1. Lol, who cares. They both are propaganda tools. Conservatives in the US tried this and it failed miserably. Facts aren't liberal or conservative. They're facts. The Chinese government has been doing stuff like this for thousands of years and it's never worked any better than any other propaganda stunt. Kudos for "instantiated", I had to google it. The Chinese written character for China is a box made of four lines and one stroke down the center. Four walls and us in the middle. Nothing's changed in 1000 years it seems. A peculiarly repetitive theme in the centralized tyranny mania through the millennia: it never occurs to them that a "nation" which has to depend on such drastic and wholesale censorship of its own citizens may not be worth "securing". At least not worth it for ordinary citizens; but only for its 'leaders' who are shite-scared of anything resembling freedom of thought/information. The only things that distinguish humans from dumb 'animal life' birth-life-death existence (never being allowed to gain insight into their existence due to the limitations placed on them by Natural 'mind limits' which Human being are not naturally subjected to....but only subjected to by censorship imposed by 'leaders' of tyrannical "nations" whose "security" is not worth "defending" in humanity terms). Let them be scared! ..who Beijing fears are being corrupted by foreign influences. That's talking too much because that's just not true. This is not a government propaganda tool any more than is the CIA World Factbook or the Encyclopedia Britannica - okay, scratch that last one. The Chinese clearly want their own Wikipedia version because most Chinese people are more comfortable with their own language, properly articulated. It makes perfect sense. So far only one Chinese military troll spotted. They must have caught on that it doesn't work.